I can't believe I have been M.I.A. for almost two weeks. I think this is probably a first for me. The three words that sum up my lack of cooking and posting these days are: work, diet and work. I won't get into the whole description but I promise every child-free minute I had these days (and some none free-child hours) I spent working. Oh, and of course my son got the dreaded stomach flu just as I was nearing my deadline... but I will not go into that either, because I really think that would be too much information. Last but not least, when you are desperately trying to drop a few pounds, having a cooking blog is not ideal. So the only logical thing for me to do (yes, I know it is not an original solution, but hey, I missed you guys) is to share some of my ideas. I know some of you out there are in the same situation and even if you don't need to get rid of some winter blubber, who doesn't want to eat healthy, right? Because the word diet makes me run (excuse the pun), I need to convince my brain I am eating normal food, real food. So I try to use the best quality ingredients, I make my dishes colorful, I try to come up with original ideas and to keep things as tasty as possible. Which, by the way, helps convince my family to eat what I am having without too much of a problem. And so I present you the eggplant burger... yes, a vegetarian burger made with eggplant, but an inverted one, and lighter than the one I made here. 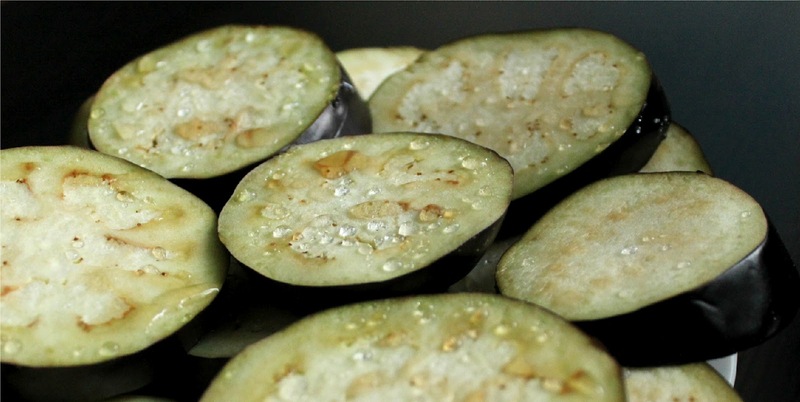 The first step of this very simple recipe is salting and draining your eggplant to get rid of excess water and possible bitterness. 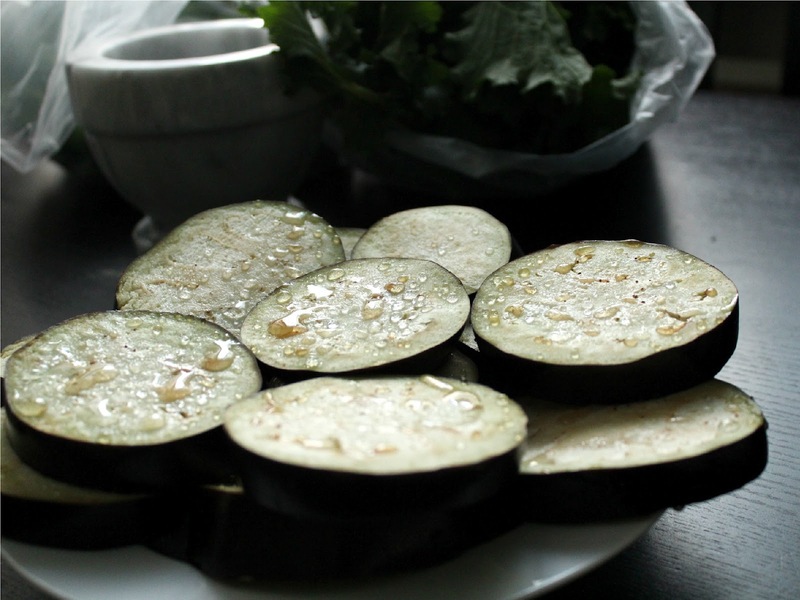 Wash the eggplant, slice it into approximately 1cm-thick slices and sprinkle with salt, letting the vegetable drain for an hour or two. in the meantime you can start cutting the tomatoes into small pieces and washing the basil and blending it with some salt and olive oil (and garlic if you like) and set both aside. When the eggplant is ready, clean it off with paper towel and grill. I used a grilling pan. Preheat the oven to 200/220°C. Now is also a good time to cut the mozzarella into slices. I used buffalo mozzarella (bufala) because it is tastier, but normal mozzarella works just as well. Once the eggplant slices are nice and cooked through, lay them out on a flat surface, brush some of the basil sauce onto all of them and place a slice of mozzarella onto half of them. Then cover these with another slice of eggplant, making a mozzarella eggplant burger. Lay the "burgers" on an oven tray lined with parchment paper or aluminum foil (the mozzarella will get runny). Heat them in the oven for a few minutes, as long as it takes for the mozzarella to get melty, making sure they don't burn. When the "burgers" look ready, put two on each plate, garnish with the tomatoes, drizzle over the basil sauce and some olive oil and a dusting of pepper and salt. I am sure this would work really well on a BBQ too if you have outdoor grilling space. Superb recipe for Making Cool in Summer day's! I like it this "Light Summer Eggplant Burger". 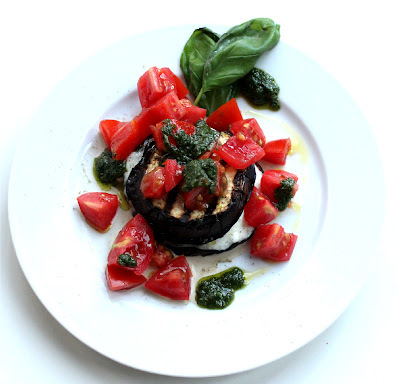 Grilled eggplant is a summer staple around my house, and heaven knows I'll eat anything called a "burger." Grilled portobellos are a must around here, too: They're a great sub for meat in most dishes, and have a great, weird squish to them when they're grilled nice and long. 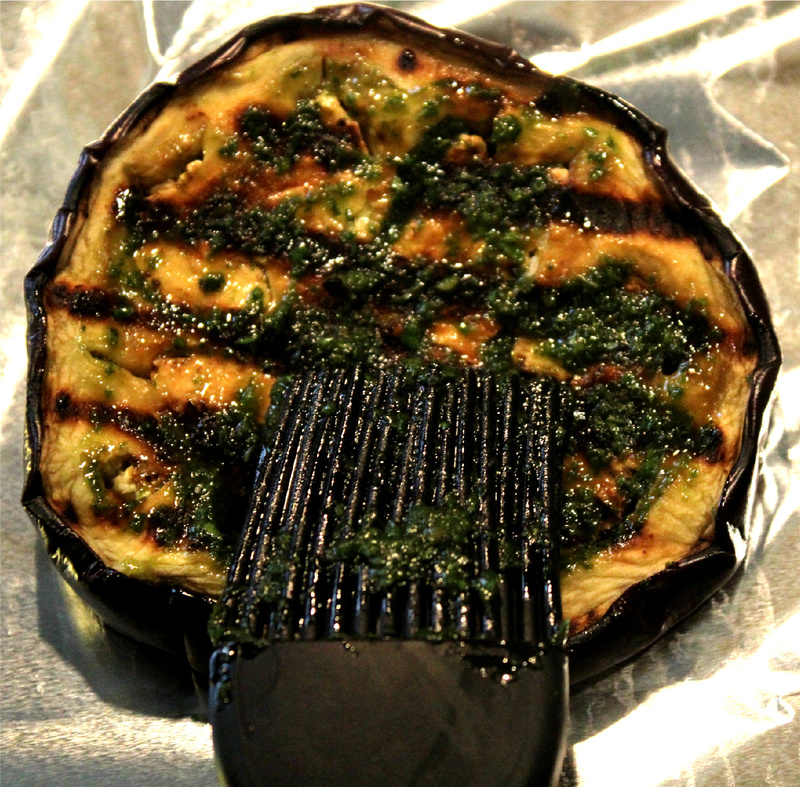 I need to find ways to dress up grilled eggplant to make it interesting... and I have to admit this one works! Boy is better although still not eating that well, thanks for your thoughts. Welcome back! Grilled aubergine (sorry, eggplant!) always reminds me of Italy - my Dad used to grill them on the BBQ every summer and my mum made an amazing layered dish with mozarella and tomato. These 'burgers' look lovely - perfect summer food. Oooh, would love to hear more about the dish. I live on tomato and mozzarella in the summer. I admit frozen mozzarella sounds a little scary, although it is good to know you can store it that way in an emergemcy... I never thought of that. I will go right over to check out the surprise. Thank you! Looks wonderful! This would go over big with my gang! Love these! We had these over here a couple months ago but did not have the brilliant idea to plate them like this and call them burgers! Love the photo! I was just thinking about how I could grill eggplants and these look pretty amazing! I will have to try it soon. Is buffalo mozz easy to find? I normally buy regular mozz, handmade at an Italian deli, but I'm assuming that's using regular milk. In Italy it is much easier to get, that is why I mentioned that regular mozzarella is fine too. You may be able to find it in some specialty stores. I hope you poor son is better, but also poor mommy you too! That "burger" looks great -- I would totally eat that without even having the word "diet" cross my mind. Btw, I know the feeling. I've been pretty remiss lately, too. It's not easy to blog when you have a demanding day job! 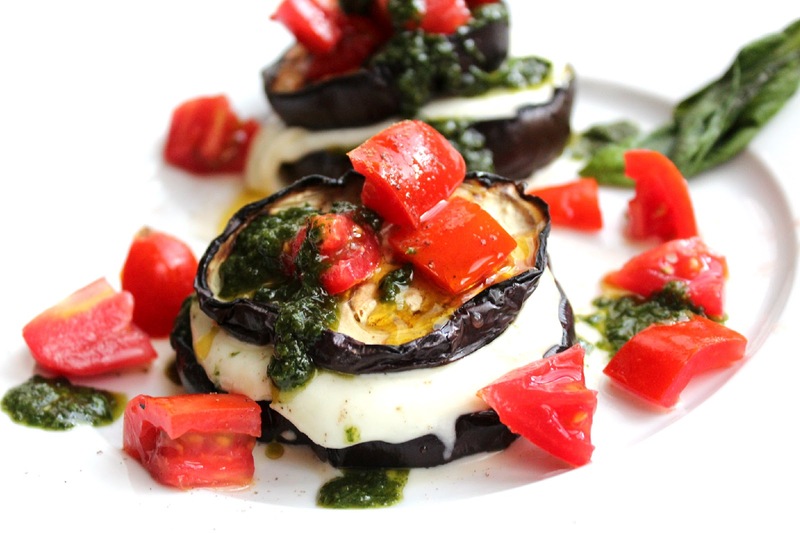 I've never had eggplant this way, and this sounds fabulous! Bookmarked! Hi Spohie, thanks for leaving a comment. Glad you liked the recipe. I've been MIA myself and had missed this great recipe!!! HAve to try it!!! Lovely dish - it looks really tasty! 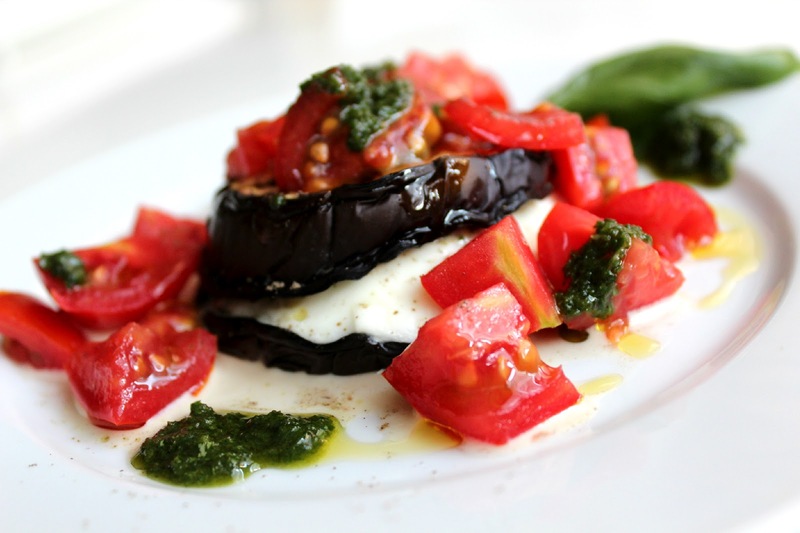 I LOVE eggplants, fresh mozzarella, basil, and vine ripe tomatoes. And you put them all together for me in one dish! Thanks! Thank you for stopping by Hyosun Ro. Then I absolutely must come over and check out your blog. Thanks afracooking!